Witnesses who refused to leave Sa-Nur said that at least two Border Guards had refused to participate in the forcible evacuation. Witnesses who refused to leave Sa-Nur until forcibly removed by security forces early Thursday said that at least two Border Guards had refused to participate in the forcible evacuation. According to the witnesses, the two were confronted by their commander, who, along with other members of the unit sent to remove the Sa-Nur protestors, were castigated for their refusal. Of the 250 protestors who entered Sa-Nur and stayed throughout the night Wednesday, about 150 – members of the 20 families who had lived in the community before being forcibly removed in the 2005 disengagement – willingly evacuated when asked to do so by officers. Another 100 protestors, mostly youths, refused – with several claiming that security forces involved in the evacuation had acted in a brutal and violent manner. The protestors said forces had used pepper gas and tear gas to quell protests, and that dozens of people, including young children, sustained physical beatings as they were forcibly dragged to buses removing them from the site. According to officials of the Homesh First organization, which helped coordinate the protest, said that unlike rumors that have been circulating, protestors and residents had not promised to leave the site willingly, but had intended to remain and use passive resistance tactics when the army tried to remove them. There was no plan or intention to face off physically against forces, as sources in the army were indicating. The IDF declared Sa-Nur a closed military area Wednesday night, and blocked shipments of food and supplies. This, after activists originally received permission to send such supplies in to the group of some 250 who were at the site. Several more families succeeded in returning to Sa-Nur on Tuesday, avoiding the security forces and their barriers. Likewise, a shipment of food and other supplies arrived in the hands of the returned residents. On Tuesday morning the families sent a letter to Prime Minister Binyamin Netanyahu and Defense Minister Moshe Ya'alon (Likud), urging them not to have IDF soldiers expel them from their homes again. "IDF soldiers are our beloved brothers, flesh of our flesh. We demand not to repeat the trauma of the expulsion, and not to force IDF soldiers to expel us again from our homes," they wrote. 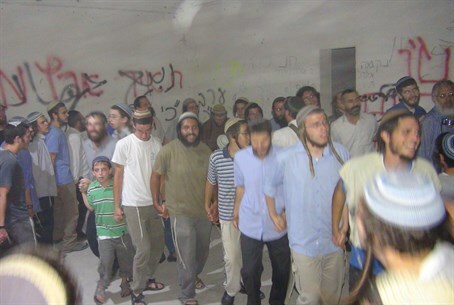 "Placing the soldiers against their settler brothers is the addition of sin to a crime. Even if the government wants to expel Jews from their homes and their land, that should be done by police officers, and not by soldiers and Border Patrol soldiers who give the best of their years for the security of Israel."